On May 17, Thailand erupted in some of the worst violence in its history as the army launched a crackdown on protesters in Bangkok. The year was 1992, and the rallying cry was democracy. The demand of the mostly middle-class protesters was the resignation of an unelected Prime Minister. After four days of violence, with soldiers firing on unarmed demonstrators, 48 were dead and hundreds injured. The conflagration came to a close after constitutional monarch King Bhumibol Adulyadej used his moral power to intervene and democracy was restored. 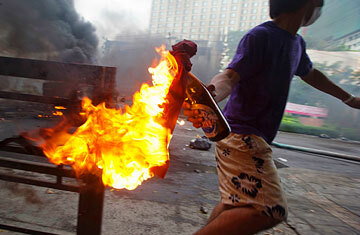 Many believed that the days of coups and revolutions in the streets were over in Thailand. Eighteen years later to the day, Thailand is engulfed in even deadlier political violence. The rallying cry is once again democracy, and the demand is the resignation of a Prime Minister. The death toll since the protest began in mid-March is 65, and the number of injured is 1,200-plus. And the violence may not be over. While the fighting in 1992 was mainly limited to the old quarter of Bangkok, the government has now declared a state of emergency in 25 provinces. Protesters have occupied the commercial heart of the capital, and gun battles have erupted in several parts of town, with acrid plumes of smoke rising above the skyline as street fighters burn tires. "I never thought I would see this kind of conflict again in Thailand," says Karuna Buakamsri, who protested as a student leader in 1992 and is now a television newscaster. On Monday, former Prime Minister Thaksin Shinawatra, ousted in a 2006 coup and living in exile rather than serve a prison term for a corruption conviction, called on the U.N. to broker peace talks between the government and the protesters, known as the Red Shirts. Thaksin is considered the driving force behind the protests. "The present action of the government dishonors our history and will forever weaken our institutions and democracy. I call for the United Nations to immediately engage to act as facilitator for this negotiation," Thaksin said in a press release. Thailand's government, however, has already rejected U.N. mediation, and Prime Minister Abhisit Vejjajiva e-mailed U.N. Secretary-General Ban Ki-moon on Sunday to explain the conflict in the country. It is a conflict more complex than its predecessor. "In 1992 we were united in what we wanted: democracy. But today people have different ideas of what democracy is. The divisions in society are much deeper," Karuna says. For the middle class that by and large supports the government, democracy now means clean, effective government and elections that are not tainted by vote-buying, fraud or violence. Some in this group have called for tougher action against the protesters. Those protesters battling soldiers in the streets are mainly from the rural poor and urban under class, and feel left out of the country's growing prosperity. The political parties they have voted into power have been ousted by the courts on electoral-fraud charges and by the military in its coup. Yet while the conflict is often portrayed as a battle between the elite and the poor, it is in fact a battle between two elites with different constituencies. The Red Shirt leaders are an entrenched political and business elite largely subservient to Thaksin. On Sunday, the government announced the freezing of financial transactions of 106 people, all associated with Thaksin and protest leaders, in an attempt to cut off the flow of funds that is helping to keep the protest going. Thaksin's elite is in conflict with members of a rival political and business elite, some of whom have closer ties to the palace, and many of whom have lined up behind Abhisit, who was elected in 2008, and his Democrat Party. Unlike the Prime Minister's experience in 1992, Abhisit's party did not win a majority of seats in parliament. Protesters believe those backing Abhisit have manipulated the political process, making it possible for him to become Prime Minister. They are demanding that Thaksin be allowed to return to Thailand with amnesty. Also unlike in 1992, the security forces are divided in this conflict. The police seem solidly behind Thaksin and have failed on numerous occasions to take action against Red Shirts who are breaking laws. The army is divided among itself, but anti-Thaksin generals are in charge. That didn't keep one officer, however, from going rogue. Major General Khattiya Sawatdiphol, known as Seh Daeng, trained the armed, militant guards of the Red Shirts and was believed to be responsible for dozens of grenade attacks around Bangkok in the past few months. His followers are believed to have shot commanding officers who led an army attempt to disperse protesters on April 10. Six soldiers and 23 protesters were killed. On May 13, Seh Daeng was shot by a sniper while talking to reporters on the edge of the Red Shirt protest site. He died Monday morning. Red Shirt leaders paid tribute to him, but his passing did not ignite a greater level of violence. How the violence will end isn't clear. The government gave protesters an ultimatum that anyone still demonstrating after 3 p.m. on Monday would face a minimum two-year prison sentence  a deadline that went largely ignored in the thousands-strong encampment in central Bangkok. Abhisit has insisted that if the protesters do not abandon their occupation, security forces will clear the area. The Thai stock market dropped 20 points on Monday afternoon after an adviser to the Prime Minister said secret talks with protest leaders had broken down. And unlike in 1992, Bhumibol may not be in a position to bring about a resolution to the crisis. The King is 82, in frail health and rarely seen in public. Some Red Shirt leaders have called for changes to the system of constitutional monarchy, while the government and its allies have accused the Red Shirt movement of disloyalty to the crown. In the past, the monarchy has typically been left out of the fray of national politics; now it is not clear whether any intervention by Bhumibol would be effective. Unless Bhumibol defies expectations and attempts to end the violence, it will be up to the people of Thailand to work out their problems. But with divisions this deep, that won't be easy or quick. In 1992, Thailand returned to normal relatively rapidly. But Karuna doesn't see that same scenario this time. "Even after this is over, the conflicts in Thai society will remain for many years to come," she says.